Before you start picking cabinet styles and colours there are a few basics that need to be addressed. There are two design philosophies: The work triangle and work zones. When kitchens were smaller, compact and a few dozen less small appliances, the work triangle made the space more ergonomic. With everything with a comfortable reach. The kitchen work triangle is an imaginary line drawn between three most used points in a kitchen which are the refrigerator, cooker/stove and the sink without any obstructions (i.e. table or an island). The ideal distance between points should not exceed 9′-0″. 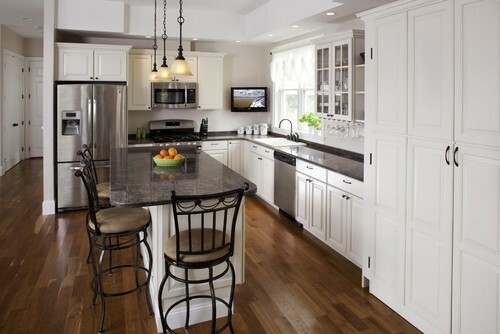 As kitchens and appliances become larger, tasks are usually grouped or zoned. Cooking, washing and storage are the most used but it could expand to include prep, baking, and entertaining to suit your lifestyle. When planning your kitchen, think about how you will use it. For an example, you would want to avoid walking with a boiling pot of water across the kitchen to drain your pasta at the sink. 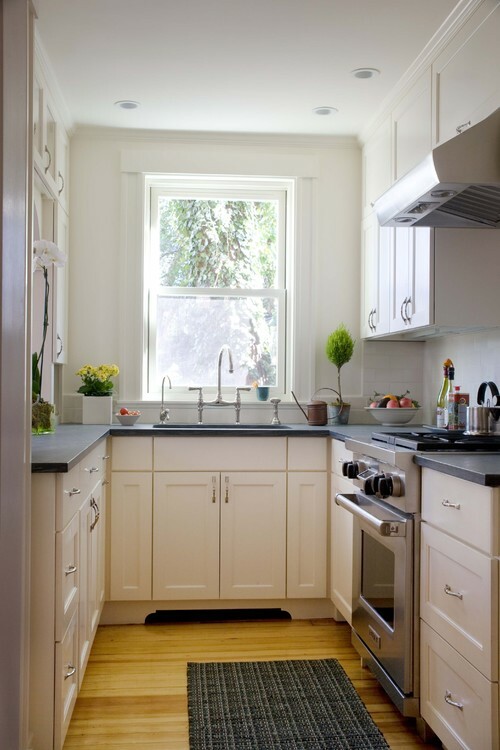 So you place the sink close to the cooker or you could add an additional prep sink if your kitchen is large enough. 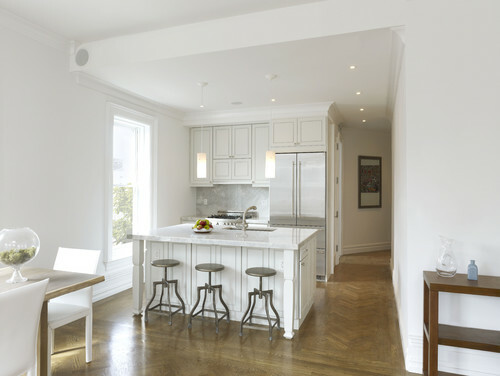 There are many layouts for a kitchen: Single line (with or without an island), Galley, L-shaped, U-shaped are among the popular configurations. Fundamentally, your layout is influenced by the size and shape of your room as well as the functions that you which to incorporate. Group larger appliances to allow for a free flowing counter space. 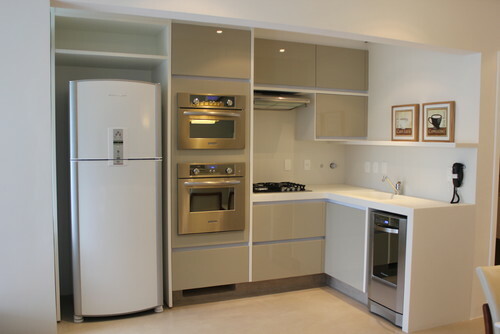 Having larger appliances dotted around the kitchen can create smaller and sometimes unusable spaces. 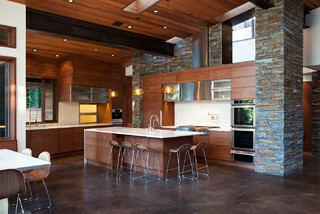 The kitchen is also influenced by its support spaces and adjacent spaces. Thinking how they interact and potentially “free-up” some area within your new kitchen. 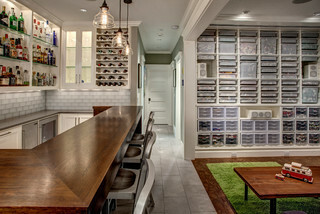 Placing over-flow storage elsewhere in a separate pantry or adding niche spaces for bar seating. One may say that “it will be fine…it’ll sort itself out” but keeping note of what you use most and when you use it, could make the morning rush a little less stressful. Grouping the coffee maker and toaster away from where you are prepping lunch boxes could relieve kitchen congestion. 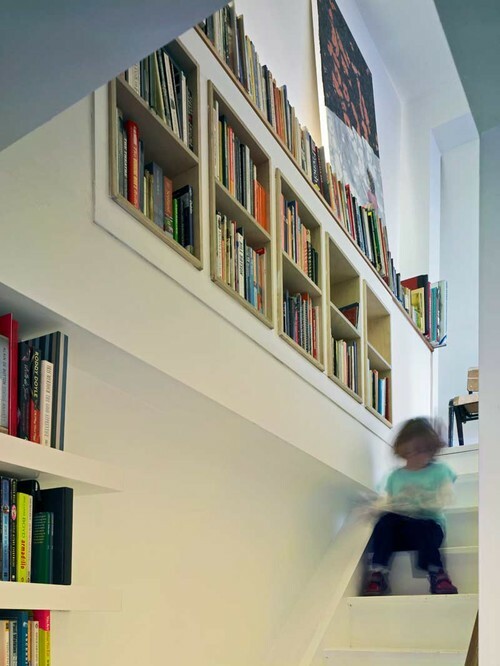 Allow adequate space and height for the things you use most. If you make smoothies every day perhaps allow it to have a permanent spot. Whereas storing that stand mixer in a pantry for the occasional use will free up some counter space for your everyday activities. Now you are well on your way to pick colours and cabinets. Have fun! 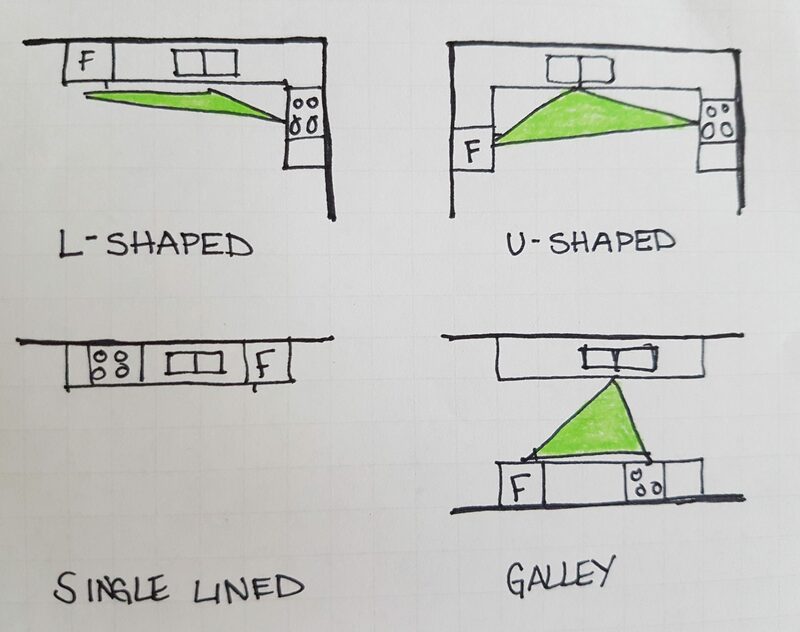 Categories: Kitchen | Tags: appliances, galley, Home improvement, kitchen work triangle, l-shaped, layout, planning, u-shaped, work zones | Permalink. Taking on “Tiny House” ideas for your own home. The concept of Tiny House Living is becoming more and more popular. The increasing number of foreclosures and unemployment in recent years has really pushed homeowners to rethink the concept of home and its size. Most tiny homes are under 500 square feet and many have stretched this notion to 150-300 square feet house on wheels. The ideals are simple living…focusing on outdoor spaces, de-cluttering and down-sizing. Smaller housing is not just for the retirees, but for those who wish to own their home who normally couldn’t afford a house or those who feel mobility fits their life style. Tiny houses do not imply to live without comfort, just using your space more wisely. That is a concept that we can all employ. Eclectic Bedroom by Somerville General Contractors Morse Constructions Inc.
Built-in floor to ceiling storage or creating a partition wall with cupboard and drawers lets you packs away all your collectibles. 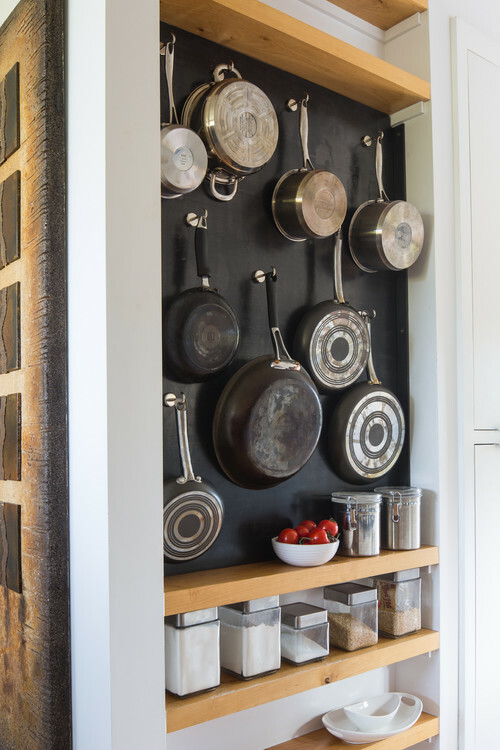 Using the vertical storage in the kitchen adds a bit more visual interest as well creating more storage. Whether choosing to incorporate shelves and/or rails to display your kitchenware or you could suspend over an island if you have the space. 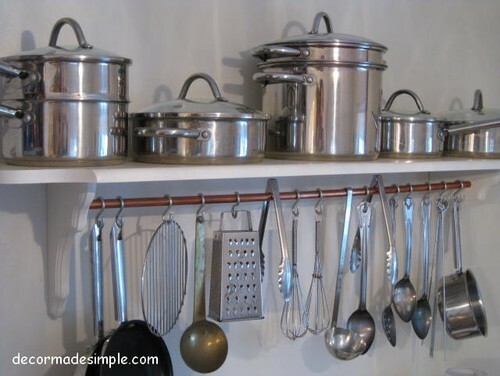 The wall solution is not just limited to pots and utensils, there are baskets you could add for spices, plants and even task boards. 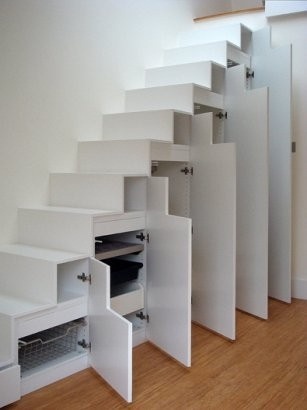 Finding extra space to store things in shallow shelves or thin concealed drawers that might be otherwise wasted. 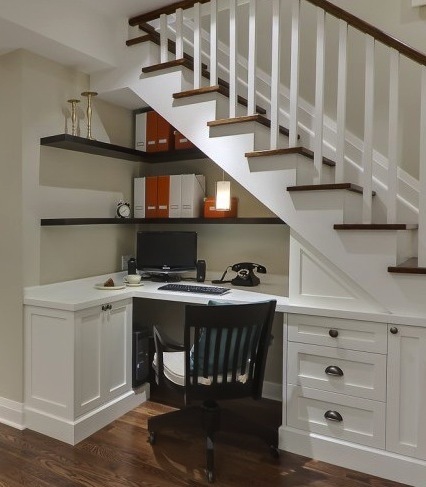 Using the dead space under the stairs is a great area for added storage, closet, home office or a powder room that can fit a number of storage needs and stair configurations. Creating a wall niche is not just reserved for the medicine cabinet. Framing out the space to add niches for art, books, shower shelving, or even to hide AV equipment. We’ve seen the storage in an ottomans and drawers in coffee tables, but the Chiva coffee table combines both ideas with elegance. Nesting tables are not a new concept, but them are coming back into trend. 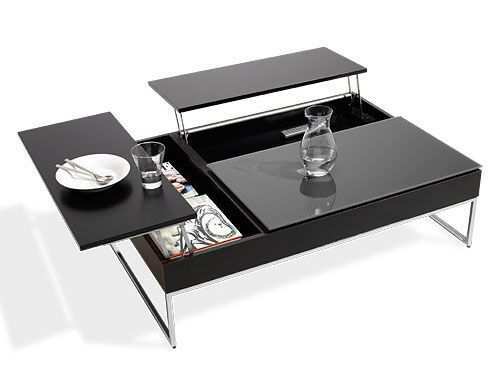 Storing tables beneath tables is a traditional and simple space saving innovation to keep. Nothing short of amazing! I love the ideas that Resource Furniture has to offer. 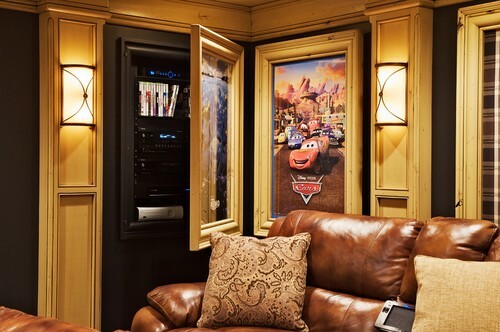 A twist on a murphy bed shown here is only a small sample of what they create. These beds are a vast improvement from the traditional hide-a-beds for guests in the living room. So comfy, they could be your own bed. Modern console table transforms into a dining table suitable for 8 people. Incredible! This storage solution is not for everyone, but for the loft or attic floor especially in a mobile tiny home, this is a great idea to incorporate storage without incrouching floor space with large furniture. If you can’t go over, go under! (the floor). 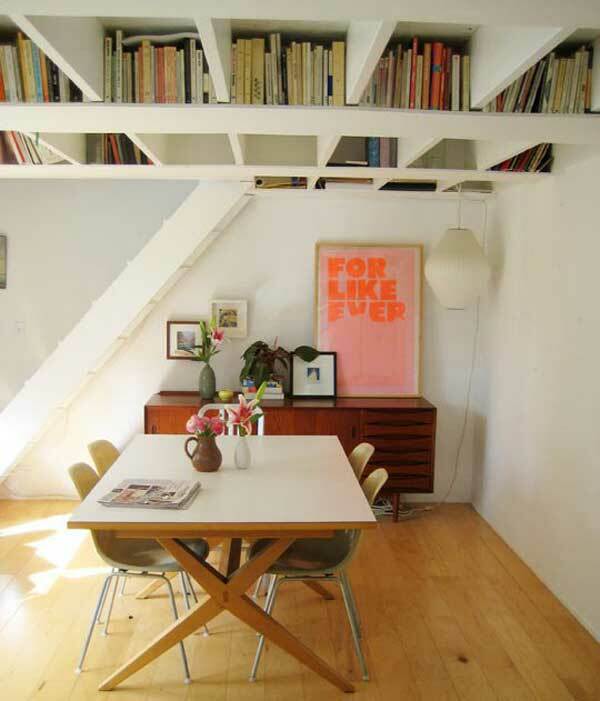 Using the ceiling space between floor joists is a great spot to keep your books and trinkets. Built-in storage into the knee wall maybe a great solution for hard to find furniture pieces and it keeps the floor space open. There is always a storage solution, no matter the size of the space. 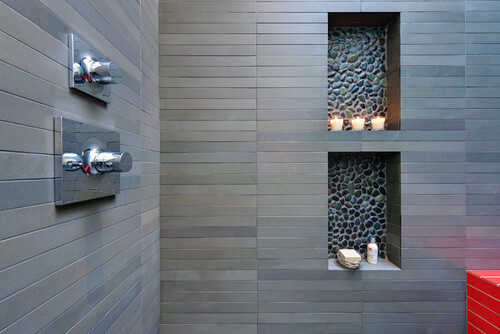 Whether choosing built-in, dual function, transforming, wall space, floor space are but a few examples to use space more wisely and many more ideas out are there. Categories: Bathrooms, Bedroom, Dining, Home Office, Kitchen, Living Room, Screens | Tags: built-in, dual function, floor space, Furniture, storage, transforming, under stairs, wall space | Permalink. So often many fall at the wayside away from colour and slump into the unfulfilled wasteland of beige! Some are intimidated to commit to using bold and bright colours in there living spaces…so goodness knows how they would react to black. OK black is not actually a colour, but it is a bold choice. 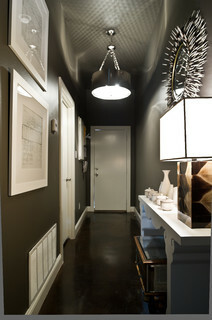 There are ways to enrich your space, just remember a little does go a long way. Black doors can help create an upscaled and elegant look, not just for the exteriors but the interior doors as well. The vertical plane of black draws your eyes to the other black objects in the room and creates a visual balance. It also helps balance the other large black elements in the home, for example that huge 60″ television that you always dreamed of, a black leather sofa or the unlit fireplace. 2. Traditional Family Room by Mount Pleasant General Contractors Phillip W Smith General Contractor, Inc. 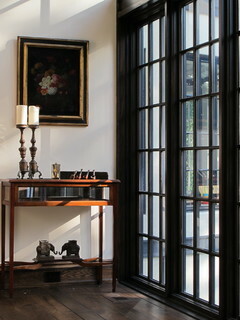 The odd thing about black or dark window woodwork is that you look past them to the outdoors. Whereas with white, your eyes tend to fix on the white frames instead of looking beyond. Bring the outdoors inside with black, charcoal or a dark stain. 3 .Transitional Dining Room by Toronto Interior Designers & Decorators McGill Design Group Inc.
Now I bet you think I have gone too far! 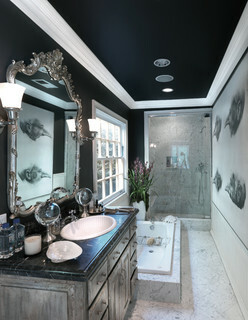 A black ceiling adds a completely different character as compared to the traditional white. Your eye has a tendency to look for defined details to inform it of boarders and boundaries. Therefore, if you had black or partially black walls with a black ceiling your eyes would be tricked by the size of the space…making the room feel more spacious. On the other hand, if you were to have lighter walls and a dark ceiling, the ceiling would appear lower. 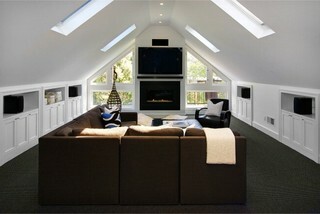 This could be beneficial in a room with a high ceiling that you wanted to make it feel more cozy and intimate. 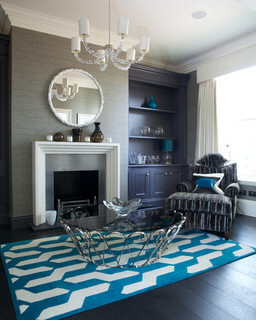 Black floor have a huge impact. It is a bit more of a finacial commitment than paint, but the rewards could be outstanding. It says luxury all over it. If you have a dog that sheds it maybe more of a chore to keep spotless and high shine floors show more dust so unless you enjoy sweeping every day opt for a matte or textured finish. 1. 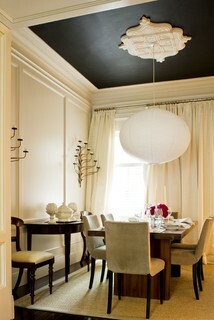 Transitional Kitchen by Saskatoon Interior Designers & Decorators Atmosphere Interior Design Inc. 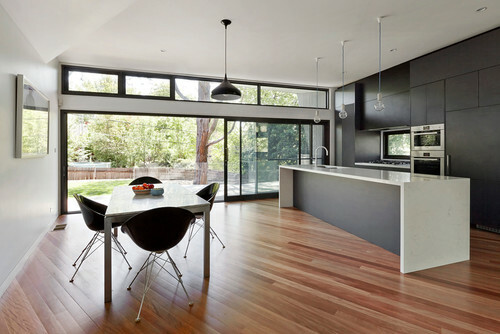 There is one way to get your white surfaces to pop in your kitchen and that is to have black cabinets. For a contemporary open layout this would be stunning. The black gives the modern white space living a new twist. However if you inverse the palette with white cabinets and black surfaces the same pop occurs, but with a more traditional appeal. 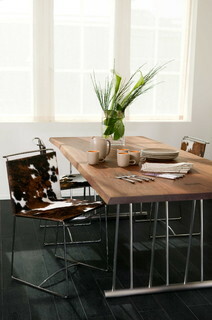 Granted, the main influence on the contemporary vs transitional vs traditional depends upon cabinetry style and layout. 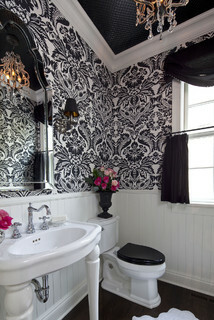 Why not paint the wainscoting black (charcoal is illustrated in the photograph) or the ornate frames. 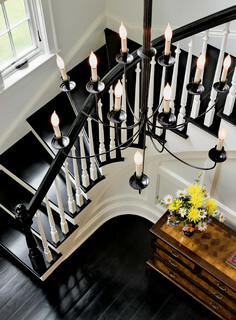 It gives the woodwork a new lease on life and celebrates its artistry and craftsmanship. The key element in using black, is that it enhances the other colours in the spaces as well (in my opinion) gives a sense of solid, grounding elegance. Dare I say, its the equivalent of that “little black dress”- a staple that imbues a air of simple sophistication. Categories: Bathrooms, Bedroom, Foyer, Home Office, Kitchen, Living Room | Tags: Black-and-white, decorative ceiling, eleganand sophisticated rooms, elegant and sophisticated rooms, Kitchen, painting, woodwork | Permalink. 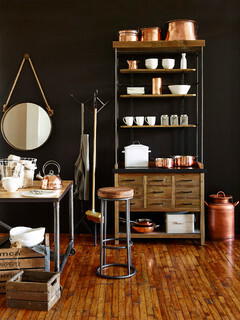 I have been jostling back and forth the idea of renovating my kitchen. Our 1924 house still has a lot of character left, which is why I fell in love with it. The house has been through a few hodge podge renovations mainly in the 1950’s. Some of it is good and some bad. The kitchen looks tired but for the exception of lacking a few modern conveniences, it functions quite well. 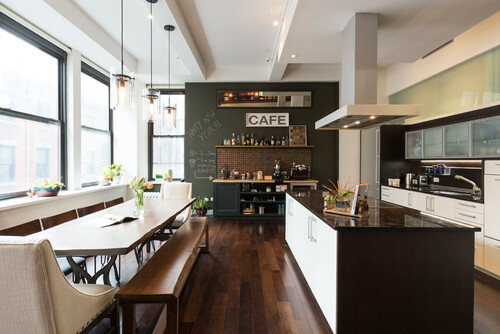 My initial thought was to revamp the whole kitchen…work from a clean slate. But the more I live here, the more I like its old charm. This house would not suit an uber-modern kitchen. Not impossible, but just a preference. They just don’t make them like they used to. You’d be hard pressed to achieve the details of the era without a skilled carpenter. 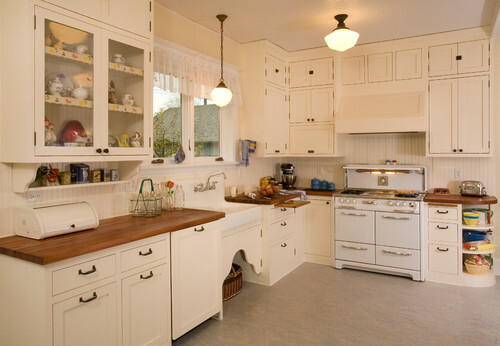 Most kitchens in the 1920’s and 1930’s were built on site, hence the reason why many of the cabinetry components are not sized exactly the same. But then that is the beauty of it. The hallmark white found in kitchens and bathrooms of the time is a reflection of society emerging understanding of germs and the resultant sanitary craze. Albeit, they thought you could “see” germs more effectively on a white surfaces. 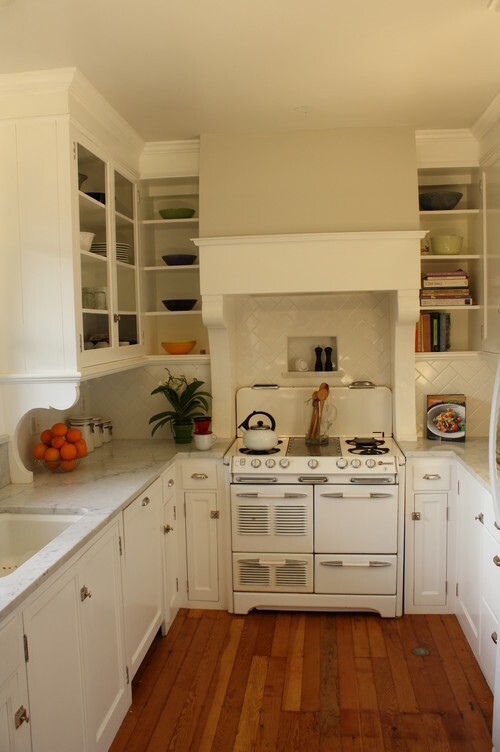 I want to show a few examples of some wonderful vintage kitchens circa 1920-1930. Some of them have been remodelled, some original and others are new to look old. The image above is a fine example of reworking with what you have and promoting its beauty. The gorgeous inset cabinet doors are a design highlight of the craftsmanship of the age as well as the pulls and lock style. The vintage O’Keefe & Merritt Stove (circa 1940?) is a great centrepiece complete with custom hood that covers a standard extractor hood fan with a drywall/ plasterboard box and added trim. The marble counter top ties this kitchen into the present as well as hiding the quintessential piece of our era…the dishwasher! 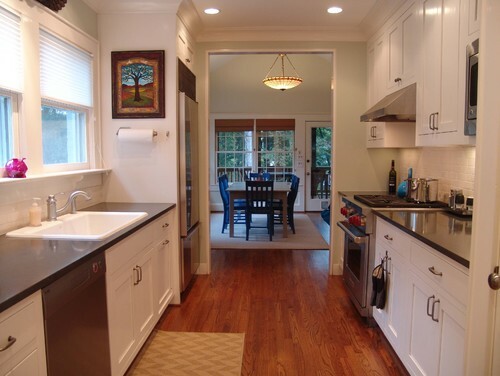 This 1920’s bungalow has a lovely remodelled galley kitchen. The expansive craftsman style windows are what makes this room sing. 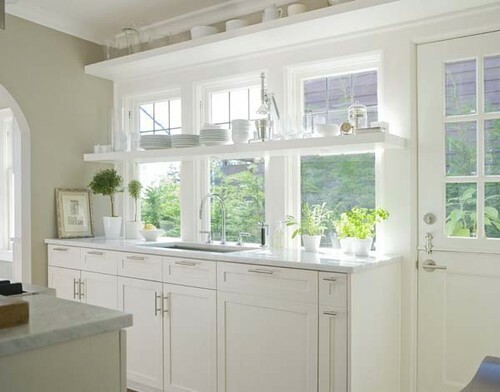 Although the cabinets are modern, the layout and open shelves are sympathetic to the architectural style. This kitchen had a low ceiling which the architect opened up to create a much loftier space with A vaulted ceiling and exposed decorative beam and collar ties. The vintage stove is a great centrepiece once again, but not to worry, the charm would still be achievable with a modern cooker or range. 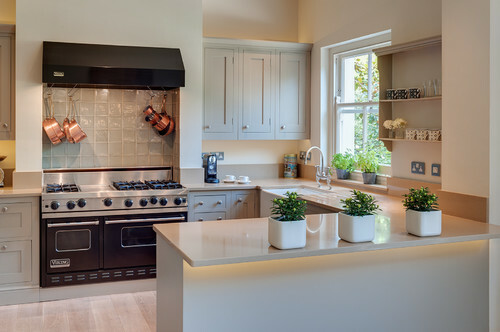 A contemporary Aga would look amazing without detracting the overall style of the room. 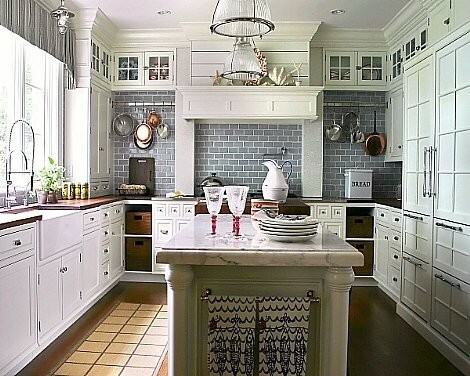 The slim 2×6 tile in a herringbone layout and gives a wonderful texture to the backsplash and still adheres to the white on white palette of the era. The tiles appear to be more artisan and slightly irregular than the typical mass-produced subway tile. Which in itself is a statement of the arts and craft (craftsman) philosophy. 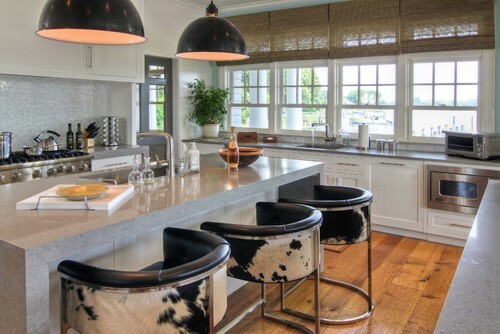 The island adds another layer of character to the kitchen. It lends itself to be a separate piece of furniture and replicates the limestone of the floor. 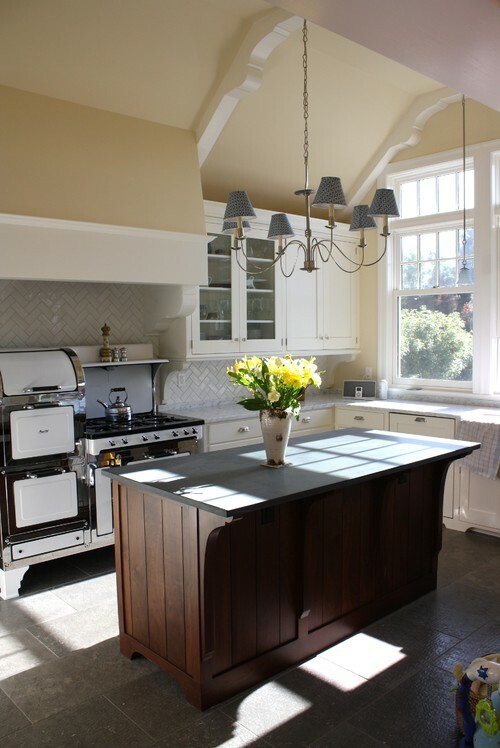 Traditional Kitchen by Everett Kitchen & Bath Designers Sadro Design Studio Inc. This kitchen is surprisingly within a 200 sqft new addition. This is a bit too “vintage” for my own taste, but you have to commend the designers integrity. 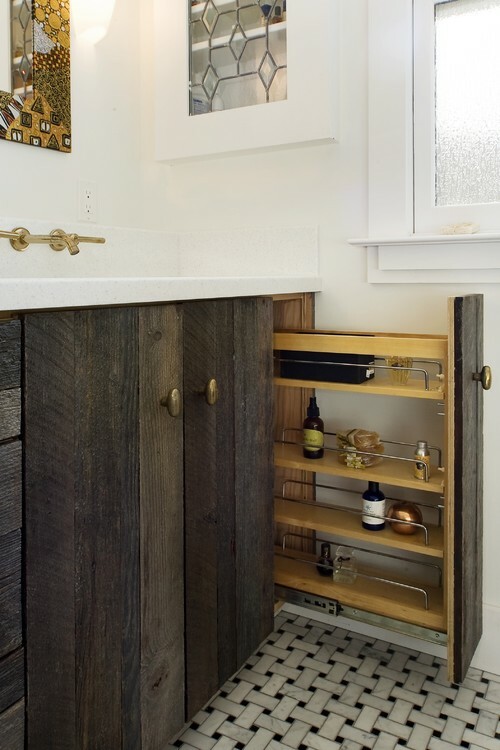 It is complete with bead board wood panel walls, pull-out integrated cutting boards and scalloped woodwork at the sink doors. Even the accessories look vintage. There are no hard and fast rules of how far you should restore your interior (unless it is a listed historical interior). Restoring does not mean that you have to do without the mod cons, if you look each kitchen above has an integrated dishwasher, so why not a wine fridge? Anything is possible, it is only a matter of how far you wish to push the envelope. Enjoy exploring the options. Categories: Kitchen, Uncategorized | Tags: arts and crafts, craftsman, inset cabinetry, Kitchen, renovation, vintage | Permalink. 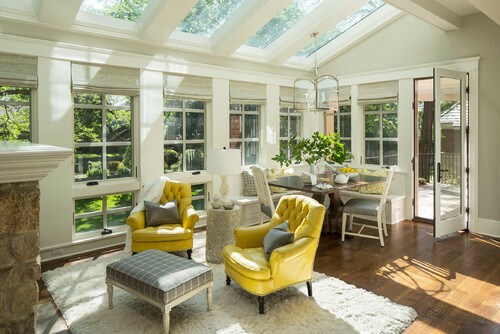 Conservatory…Sun lounge…inside-outside room…Sun room, whatever you like to call it they are almost one in the same. 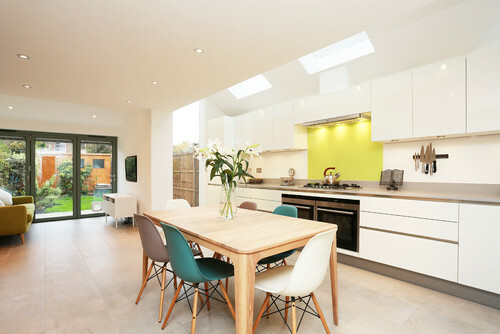 All are enclosed in windows, although a conservatory has the addition of a glazed roof. Not too dissimilar to a greenhouse attached to your house, but far more detail orientated. Traditionally, a conservatory was used to house citrus fruits and tropical plants brought back to Britain from merchant traders during in the Victorian and Georgian eras. The delicate plants of India, Africa and the Far East needed shelter from the more northern climates. Nowadays, the conservatory is used as an additional room in the house. Integrated into the whole functionality of the house a conservatory can bring the wow factor into your home. Often used as an additional sitting area or lounges, the amount of glazing brings you closer to nature but leaving the elements at bay. 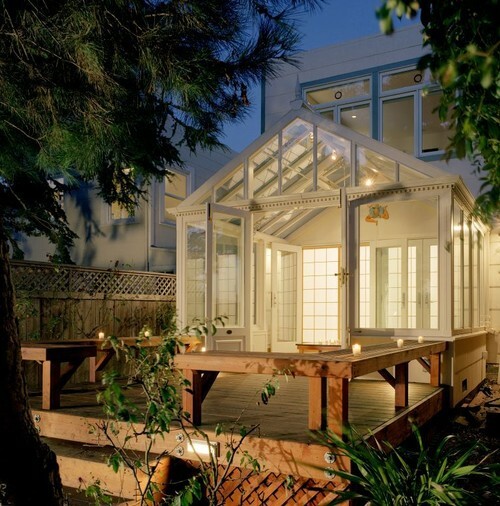 This gorgeous example of a conservatory brings an homage to the traditional grandeur that the Victorian era exuded. Used as a sheltered seating area of the deck, it creates a cascade of spaces from house to shelter to deck to garden with each step unwrapping its layers. Modern Home Office by New York Architects & Designers Studio ST Architects, P.C. With a flair to the modern, this home office is inspiring. The gentle curve of the glass softens the space. The sloping glass has a filter to protect the residents as well as retractable blinds for additional shading. Most glass used in conservatories do have UV and protective coating options much like typical windows. 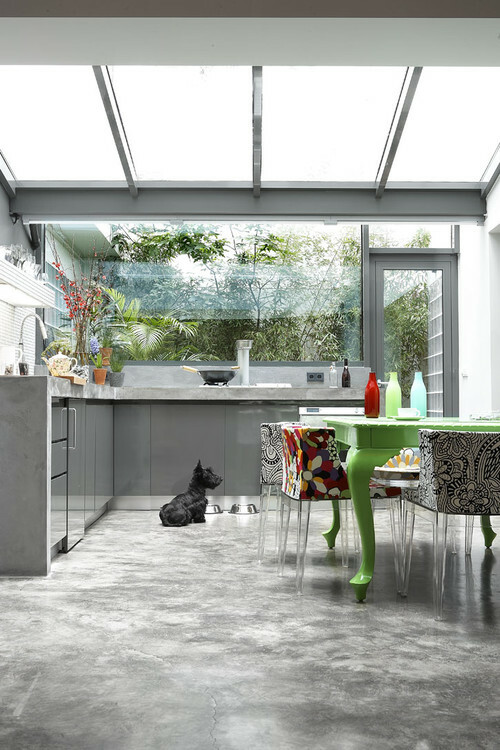 The fabulous monochrome kitchen takes a step back as it lets the back garden/courtyard play at the window. The sleek simplicity from head to toe just draws you in. Categories: Home Office, Kitchen, Living Room, Outdoor spaces | Tags: Computer desk, glass, Home and Garden, Home Office, lots of light, relaxation | Permalink.